Stewardship is an integral aspect of our faith, and for seminarians it must have a very high priority. For that reason St. John’s Seminary is committed to a program of recycling waste products. Separate recycling baskets are provided in each seminarian’s room, in the recreation room, the offices, and the trash collection areas in the dormitory buildings. In addition, aluminum cans are collected and redeemed by the Mission, Peace and Justice Society, as a means of raising funds for charitable purposes. The cooperation of each seminarian, faculty and staff member in this area is most appreciated. Particular care is to be exercised in the use of water and electricity, not only as a concrete sign of responsible stewardship of these valuable resources, but also as a way to minimize costs. Seminarians are encouraged not to smoke. In accord with provisions of Camarillo City Ordinance 658 and the Ventura County Ordinance 3888, the seminary administration prohibits smoking in the corridors and passageways, public rooms and student rooms of the campus, including the small television room and the individual dormitory rooms; smoking is not allowed inside the perimeter road, with the exception of the lower carport area and the fountain area. The county ordinance states that when the needs of smokers and nonsmokers conflict, “the need to breath smoke-free air should have priority.” Students are also cautioned about infringing upon this right to smoke-free air by burning incense in their rooms. In order for mail to be forwarded to students on internship, during vacation periods, following ordination or after departure from the seminary, students are requested to provide the seminary with preprinted mailing labels. Blank mailing labels are available from the Director of Students or the Monitor. Only first-class mail can be forwarded. Other classifications of mail will be retained until the student returns to claim it. After a student has departed from the seminary, if mailing labels are not provided, all first-class mail will be returned to the sender. 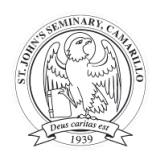 The Camarillo Post Office will not forward any mail with the delivery address of the seminary.